BAGHDAD, Iraq (CNN) -- A U.S. Apache helicopter went down Friday in Iraq, killing two American soldiers, the military said. It was the fourth helicopter to crash in two weeks. The U.S. military recovered the soldiers' remains and secured the site northwest of Baghdad near Taji. The number of U.S. military fatalities in the Iraq war stands at 3,090, including seven civilian contractors of the Defense Department. The Pentagon could not say whether the AH-64 crashed or was shot down. However, an Iraqi Interior Ministry official said earlier that Iraqi soldiers in Taji, about 12 miles (19 kilometers) north of Baghdad, saw the chopper fall from the sky after an insurgent attack. Nineteen Americans died in the three other copter downings. Of those, two U.S. troops were killed when another Apache was lost during fighting with insurgents last weekend in Najaf. Last week, a U.S. helicopter providing air security for two U.S. Embassy officials came under heavy fire and crashed in eastern Baghdad, killing five employees for the Blackwater private security company. Three Iraqi insurgent groups claimed responsibility for the attack. On January 20, a U.S. military Black Hawk helicopter -- believed to have been downed by a shoulder-fired missile -- crashed in Diyala province, killing 12 U.S. soldiers on board. A "suspected death squad leader" has been seized in a raid in Baghdad, the U.S. military said Friday. Iraqi army special forces and U.S.-led coalition advisers made the arrest Thursday in southern Baghdad. "The death squad leader is allegedly responsible for carrying out kidnapping and murders against innocent Iraqi civilians" in three neighborhoods, the military said. The military said the man runs a 20-man cell and is suspected of setting up illegal checkpoints to kidnap and kill Iraqis. "The leader and his cell are implicated in the kidnapping of thee Iraqi civilians December 10, 2006, and burning them alive," the military said. The military said the insurgent also is allegedly responsible for killing and torturing an Iraqi school principal when he "refused to allow the suspect to use the school as a place to conduct illegal interrogations and judicial killings." "Key terrorist leaders" might have been killed in a coalition airstrike Friday targeting al Qaeda in Iraq militants on the outskirts of Baghdad, the U.S. military said. Troops were targeting an insurgent network said to be responsible for car bombings, roadside bombings and sniper attacks across the capital. "Coalition forces believe that key terrorist leaders were killed during the airstrike. Results are still being assessed at this time," the military said. The death toll from two explosions that ripped through a crowded market Thursday evening in Hilla rose to 73, with at least 163 listed as injured, police said Friday. 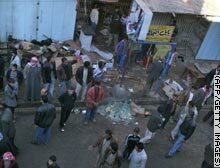 The death and destruction began at the start of the Muslim weekend -- a time when people customarily go to marketplaces -- after two suicide bombers detonated their explosives. Three U.S. troops died Thursday in Anbar province, west of Baghdad, the U.S. military said. A Marine and a sailor assigned to Multi-National Force-West died from wounds "sustained due to enemy action," the military said. Another Marine died from "nonhostile causes," the military said. Earlier Friday, the military reported the deaths of three American soldiers in vehicle accidents. Baghdad police reported the discovery of 23 bodies around the capital Friday. Such findings have occurred daily in Baghdad, reflecting the sectarian violence pervading the city and elsewhere. CNN's Barbara Starr and Mohammed Tawfeeq contributed to this report. Iraqis gather Friday near the Hilla marketplace where 73 people died in an attack by suicide bombers Thursday. TIME.com: Iran out for revenge?